This article discusses the impact of the U.S. Supreme Court’s landmark decision in South Dakota v. Wayfair, Inc.1 and provides guidance related to resulting changes. In addition to evaluating the ruling in Wayfair and the precedents that went before it, this article offers a primer on the fundamental concepts of state sales and use tax principles underpinning Wayfair, including substantial nexus, economic nexus, physical and economic presence, the Commerce Clause, the dormant Commerce Clause, and the Due Process Clause. THE COURT’S RULING IS OF VITAL IMPORTANCE TO TAX practitioners because of its sales and use tax collection impact that will reach large and small companies’ internal processes and compliance systems. 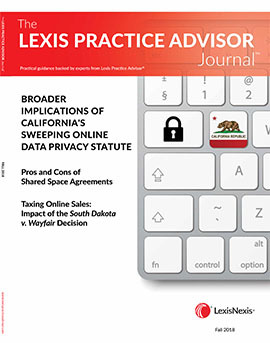 Attorneys who represent remote sellers and e-retailers should evaluate the ruling’s implications with respect to their e-retailer clients’ new burdens to record, collect, and remit sales tax from many state and local tax jurisdictions. The Wayfair ruling overturns prior Supreme Court precedent in Quill Corp. v. North Dakota2 and Nat’l Bellas Hess v. Dep’t of Revenue.3 In the Quill and Bellas Hess decisions, the Court ruled that out-of-state sellers are obligated to collect and remit sales tax on in-state sales only where the company has a physical presence. The Wayfair ruling overturns Quill, with the majority opinion holding that it was the Court’s obligation to make amends for Quill’s unsound and incorrect reading of the Commerce Clause. Conversely, Chief Justice Roberts and his fellow dissenters felt that the Wayfair ruling exemplified a Court that was overstepping its authority, as it should be the responsibility of Congress to change the physical presence standard. Nexus means the minimum level of activity a taxpayer must have in a state before that state has the right to tax the taxpayer. For corporate income tax purposes, several states have adopted an economic nexus standard for determining whether an out-ofstate taxpayer is subject to tax on its business income in the state. Economic nexus is premised on a theory of regular and continuous exploitation of the in-state market. Thus, a certain amount of a taxpayer’s business income can be apportioned to the state if the level of activity in that state meets a prescribed threshold, regardless of whether the taxpayer ever sets foot in that state. The foundational principles of state taxation involve the Commerce Clause and the Due Process Clause. These concepts are important in evaluating Wayfair because state taxation cases hinge upon whether the state’s system of taxation interferes with interstate commerce. Also of importance is the dormant Commerce Clause, which was used to decide Quill. The Commerce Clause4 addresses the right of the federal government to regulate interstate commerce. With state tax cases, the initial evaluation is whether the state’s system of taxation interferes with the principles of interstate commerce. In order to satisfy the Commerce Clause, the activity taxed must have a substantial nexus to the taxing state. The Quill court based its ruling on the dormant Commerce Clause, the legal doctrine that prevents a state from interfering with interstate commerce unless Congress gives its authorization. However, in Quill, the Court ruled that the dormant Commerce Clause did not prevent North Dakota from imposing a sales tax on online retailers located out of the state. The Due Process Clause5 is rooted in the concept of fairness to the selling business. The seller needs to have nexus with the state. If the seller does not have physical presence in the state, then the state cannot force the seller to collect taxes on behalf of that state. Due process issues are the exclusive domain of the courts. Due process, though, does not mandate physical presence. Due process considers whether the individual has enough nexus to meet the standards of fairness. For many years, most states have relied heavily on the collection and remittance of sales and use taxes to generate revenue. Generally, the seller has the primary responsibility to collect and remit sales tax to the state. When sales concern in-state sellers, this is not a problem. Clearly, there is a connection between the state and the taxpayer. The collection and remittance of tax becomes more complex, though, when out-of-state sellers engage in transactions with in-state customers. States that impose sales tax also impose a complementary use tax for those transactions in which the in-state customer purchases tangible personal property outside the state for use in the state and for which sales tax has not been imposed on the transaction. So, for example, if you live in New York and purchase an item in New Hampshire for use in New York, you still have an obligation to pay use tax to New York, the state in which you live and where you are going to use the property. Consumers usually fail to pay the use tax because it is self-assessed. The taxpayer’s failure to pay use taxes was a factor in South Dakota’s actions in Wayfair. The tax can be applied only to an activity having a substantial nexus with the taxing state. The tax does not discriminate against interstate commerce. The tax is fairly related to the services provided by the states. In Quill, the seminal case for sales and use tax nexus since 1992, the Court expanded on the concept of nexus for purposes of state taxation. The Quill Court stated that nexus consists of both a minimum contacts analysis under the Due Process Clause and a substantial nexus test under the Commerce Clause.10 In addition to addressing the concept of nexus, the Quill case is vital because it established the concept of physical presence, which the Wayfair case has reversed. Did Quill meet the Due Process and Commerce Clause Standards? In Quill the Court applied separate Due Process Clause nexus and Commerce Clause nexus requirements in its analysis of whether the corporation had the requisite nexus to North Dakota. The Court decided that there was sufficient nexus under the Due Process Clause, but not under the Commerce Clause, because physical presence in the state was required. Due process does not require physical presence; instead, due process is concerned with giving an individual notice and fairness. To meet the due process standards, purposeful direction of the seller’s activities at the state’s residents must be shown, and the tax has to be related to the benefits that the seller derives from the state. The Quill case may have met these standards. The Court ruled that Quill, Inc. had sufficient nexus to the state of North Dakota under the Due Process Clause because the company had “purposefully directed its activities at North Dakota residents, that the magnitude of those contacts is more than sufficient for due process purposes, and that the use tax is related to the benefits Quill receives from access to the State.13” In short, the Quill Court ruled that physical presence is not required for specific jurisdiction with respect to due process. Although the Quill Court stated that there is a close relationship between the Due Process Clause nexus and Commerce Clause nexus, the company did not have substantial nexus under the Commerce Clause because it lacked actual physical presence in the state. Under Quill, to meet the test for sufficient nexus for the Commerce Clause, a business needed to be more than a mail order operation; the business was required to have a retail store in the taxing state or office space in the taxing state. Wayfair is a challenge to the Quill physical presence standard arising as a result of the growth of e-commerce. Because under Quill sellers were not required to collect sales tax on sales made to customers where the seller was not physically present, the in-state purchaser was not charged sales tax. Although the purchaser had a requirement to pay use tax on these tax-free purchases, use tax compliance was very low. In Wayfair, the Court held that the Quill and Bellas Hess Courts had incorrectly interpreted the Commerce Clause.15 As a result, retailers can no longer rely on the physical presence test to determine remote seller nexus. The Court held that the economic nexus standard outlined in the South Dakota statute, 2016 S.D. S.B. 106 (S.B. 106), met the requirements of the Commerce Clause because it was not overly burdensome to remote sellers. In addition, the sales and transaction-based nexus thresholds were coupled with non-retroactive application and South Dakota’s participation in the Streamlined Sales and Use Tax Agreement (SSUTA). The seller had over $100,000 of gross revenue from the sales of tangible property, digital property transfers, or services in South Dakota. The seller engaged in 200 or more separate transactions in tangible property, digital product transfers, or services delivered within the state of South Dakota. S.B. 106 foreclosed the retroactive application of these requirements and provided means for the statute to be appropriately stayed until the constitutionality of the law had been clearly established.17 South Dakota’s intention was for retailers outside of South Dakota meeting these thresholds to collect South Dakota sales tax and remit the tax to South Dakota. South Dakota sued several out-of-state retailers, including Wayfair, Overstock.com, and Newegg. South Dakota’s goal was for Quill to be overturned. South Dakota filed a declaratory judgment in its state court against specific internet merchants with no employees or office buildings in the state who also failed to collect sales tax on their internet sales. South Dakota also sought an injunction to force these internet merchants to register for business licenses in the state and to remit sales taxes to the state. In response, the merchants moved for summary judgment, stating that S.B. 106 was unconstitutional. The South Dakota courts sided with the merchants, holding the law to be unconstitutional, and in turn, the Supreme Court granted certiorari. As noted above, the Court referenced South Dakota’s participation in the SSUTA as a factor to consider in upholding the constitutionality of the law.18 The purpose of the SSUTA is to simplify and modernize sales and use tax administration in its member states to substantially reduce the burden of tax compliance. The agreement focuses on improving sales and use tax administration systems for all sellers and for all types of commerce. Justice Anthony Kennedy wrote the majority opinion, and he was joined by Justices Clarence Thomas, Ruth Bader Ginsburg, Samuel Alito, and Neil Gorsuch. Justices Thomas and Gorsuch filed separate concurring opinions. Justice Kennedy’s opinion begins with a detailed analysis of Commerce Clause jurisdiction. So, who are the winners and losers in the fight over sales tax collection? Tax attorney and author Mark Muntean says that brick and mortar businesses may be winners, while online retailers are the obvious losers (as well as consumers, who will pay additional taxes). Brick and mortar stores will no longer be at a price disadvantage. Muntean thinks that states may not be big winners, though. For the parties involved in Wayfair, the next step is for the lower court to resolve those issues that the Court directed to resolve on remand. As the Court noted, since the issue of physical presence was the focal point of the case, and under the Quill standard the lack of physical presence would have invalidated the law, other issues that arise with respect to satisfaction of the Commerce Clause requirements were not briefed or litigated.26 Thus, the Court remanded the case to the lower court for a determination as to whether the law satisfies the Commerce Clause requirements that it not discriminate against, or place an undue burden on, interstate commerce. The law must still meet the applicable four-pronged test of Complete Auto to satisfy its constitutionality. The Court did tip its hand when it listed the reasons that the law would be constitutional, including noting the relative ease of its compliance requirements, the standardized system of collection that reduces administrative costs and burdens, its participation in the SSUTA, and its safe harbor threshold. South Dakota provided out-of-state retailers with free software to assist them in complying with its sales tax. South Dakota has a single, centralized tax collection agency, and taxpayers are not required to deal with individual city or county taxing authorities to collect and remit local taxes. As a participating member state in SSUTA, South Dakota has adopted a simplified and uniform mechanism to alleviate compliance burdens for multistate taxpayers in the sales and use tax realm. One of the considerations as to the constitutionality of the South Dakota law was the fact that the law has a safe harbor threshold of $100,000 or 200 transactions. How does this impact other states with thresholds lower than South Dakota or that do not have thresholds built in to the law? For small businesses doing limited business across state lines, this can have significant impact. The Court found that the South Dakota law was not a burden on interstate commerce in part because it did not place an undue burden on small businesses or small taxpayers engaged in a minimal level of interstate activity. Whether the failure to incorporate a threshold level of activity in a law would affect the constitutionality or validity of the law remains an outstanding issue. If Congress does decide to address the issue of marketplace fairness, the level of activity is one that would have to be worked out. With modern technology and the relative ease of reporting, particularly in those states that participate in the SSUTA, even the low threshold level of $100,000 would most likely not unduly burden relatively small sellers. Another consideration for practitioners in other states is whether the standard enunciated by the Court can be applied retroactively. Although it is not a consideration in South Dakota, whose law provides for prospective only application, some practitioners have expressed concerns that those states that are searching for much needed revenue and that do not have a built-in prospective application will aggressively seek to have the Wayfair decision applied retroactively. Despite retroactivity not being an issue in this case, Justice Kennedy’s majority opinion did note that the South Dakota law is prospective only, but he did not elaborate on what this meant with respect to earlier transactions. If, as the majority indicated, Quill was a misapplication of substantial nexus, and the standard should not have required physical presence, then to what extent can the law exclude the physical presence requirement in determining substantial nexus? Although it seems unlikely that any law would be applied retroactively, the possibility remains open. The Court found that the state's participation in the SSUTA reduced the potential to impose undue compliance burdens. The SSUTA, which simplifies compliance for taxpayers who engage in transactions across state borders, contains several simplification and uniformity requirements that participating states must adopt to remove or reduce the undue burdens on all sellers. Attorneys Carolynn S. Kranz and Iris M. Kitamura, who specialize in local and state tax issues, assert that only states that have adopted the provisions of the SSUTA and have addressed retroactivity and small business protection should be convinced that Wayfair is a win. Congress has been given the opportunity in recent years to apply a uniform standard to the issue of marketplace fairness and remote sellers. Although several bills have been introduced to address the issue, none has made it out of the House or Senate. In light of Wayfair, Congress might want to consider the need for uniformity and consistency in multistate transactions, particularly those conducted in e-commerce. Muntean suggests that online retailers may look to Chief Justice Roberts’ dissent for their best strategy going forward. While the Wayfair decision applies to the imposition of sales taxes, Professor Charles Swenson foresees potential income tax implications as well. Kranz and Kitamura provide this advice for businesses who are unsure on how to proceed after Wayfair. Professor Swenson urges legal counsel to work with their business clients to ensure that their clients’ sales tax software will meet the requirements of Wayfair. Mark Muntean, J.D., LL.M. Taxation (Georgetown) is a business and tax lawyer in the San Francisco Bay Area of California with nearly 40 years of experience in federal, state, and international tax matters. He represents clients in connection with IRS and state tax matters, excise tax matters, criminal tax issues, mergers and acquisitions, private equity, and other business law matters. Mr. Muntean is a regular contributor to the Lexis Quarterly Tax Journal, is the co-author of Ballantine & Sterling California Corporate Laws (Matthew Bender), and is the author of Business Organizations: Professional Corporations and Associations (Matthew Bender). Charles Swenson, CPA, PhD, is Professor and Leventhal Research Fellow at the Marshall School of Business at the University of Southern California. He is also the co-founder of IITGDiscover.com. An author of more than 50 articles and books, he is General Editor of Bender’s State Taxation: Principles and Practice (Matthew Bender). Carolynn Kranz is the founder and managing member of Kranz & Associates PLLC (www.saltattorneys.com), a boutique law firm specializing in state and local tax matters in the 50 states and District of Columbia. She is also the founder and managing member of Industry Sales Solutions, LLC, a company that offers a subscription database containing the sales and use taxability of software related transactions. In addition to her sales and use tax expertise, Carolynn has significant experience in state and local income / franchise tax, as well as federal tax matters. Iris Kitamura is an associate at Kranz & Associates, PLLC, a law firm specializing in state and local tax consulting. Iris specializes in state and local tax matters on a multistate basis, particularly in the area of sales and use taxes. She has over 15 years of experience in state and local taxation and contributes to the LexisNexis publication State Tax Guide to Digital Content and Cloud Services, and co-authored “Taxing Software and Cloud Computing: Yesterday’s Law and Today’s Technology,” Tax Analysts Special Report (2011). 1. 201 L. Ed. 2d 403 (2018). 2. 504 U.S. 298 (1992). 3. 386 U.S. 753 (1967). 4. U.S. Const. Art. I, § 8, Cl 3. 5. U.S. Const. Amend. XIV § 1. 6. See GAO, Report to Congressional Requesters: Sales Taxes, States Could Gain Revenue from Expanded Authority, but Businesses Are Likely to Experience Compliance Costs 5 ((GAO–18–114, Nov. 2017) (Sales Taxes Report)). 7. 430 U.S. 274 (1977). 8. Id. at 279. 9. Nat’l Bellas Hess, 386 U.S. at 760. 10. Quill, 504 U.S. at 313. 11. Id. 12. 326 U.S. 310, 316 (1945). 13. Quill, 504 U.S. at 308. 14. Quill at 313. 15. Wayfair, 201 L. Ed. 2d at 426. 16. 2016 S.D. S.B. 106. 17. Id. 18. Wayfair, 201 L. Ed. 2d at 426. 19. Id. at 411. 20. Id. at 427. 21. Id. at 428. 22. Id. at 428. 23. Id. 24. Id. at 432. 25. Mark Muntean, South Dakota v Wayfair: The Evolution of State Sales Tax, 2018 Emerging Issues 8655. 26. Wayfair, 201 L. Ed. 2d at 426. 27. Id. at 425. 28. Id. at 426-427. 29. Carolynn S. Kranz and Iris M. Kitamura, Streamlined Sales Tax States Win, Will Others Follow Their Lead?, 2018 Emerging Issues 8657. 30. Muntean, supra note 25. 31. California (Cal. Rev. & Tax. Code § 23101(b)), Colorado (Colo. Rev. Stat. § 39-22-301(2)), Connecticut (Conn. Gen. Stat. § 12-216a(a), Informational Publication 2010 (29.1)), New York (N.Y. Tax Law § 209(1)(b)), Ohio (Ohio Rev. Code Ann. § 5751.01(I)), and Washington (Wash. Rev. Code Ann. § 82.04.067). 32. Charles Swenson, A New Paradigm for Sales Tax: The Wayfair Decision and Nexus, 2018 Emerging Issues 8656. 33. Kranz and Kitamura, supra note 29. 34. Swenson, supra note 32.